Habaki : Copper single Habaki. Blade length :　71.2　cm or 28.03 inches. Sori : 1.1 cm or 0.43 inches. Width at the hamachi : 3.27 cm or 1.28 inches. Width at the Kissaki : 2.23 cm or 0.87 inches. Kasane : 0.61 cm or 0.24 inches. Shape : A little bit Suriage, wide and thick Katana. Around the Sashiura part, there is a tiny Ware(crack). But it is not serious. Hamon : Nie Deki, Suguha with small Ashi. The Nioikuchi is soft. It reminds us of Echizen Rai. Special feature: After 2nd generation of Yasutsugu, the problem of a successor arose between his first and second son. They established a brance family of Edo and Echizen. The first son(Umanosuke) succeeded to Edo 3rd generation. The second son(Shirouemon) succeeded to Echizen 3rd generation. This blade was made by Echizen 3rd generation. Saya : Red color Saya. Tsuba : Iron Tsuba, cherry flowers are engraved. Menuki : Shakudo, flower and wheel are engraved with gold color. Fuchikashira: Iron, arabesque with gold color. From Aoi Art: Echizen Yasutsugu continuned to 9th generation. Edo Yasutsugu continued to 12th generation. 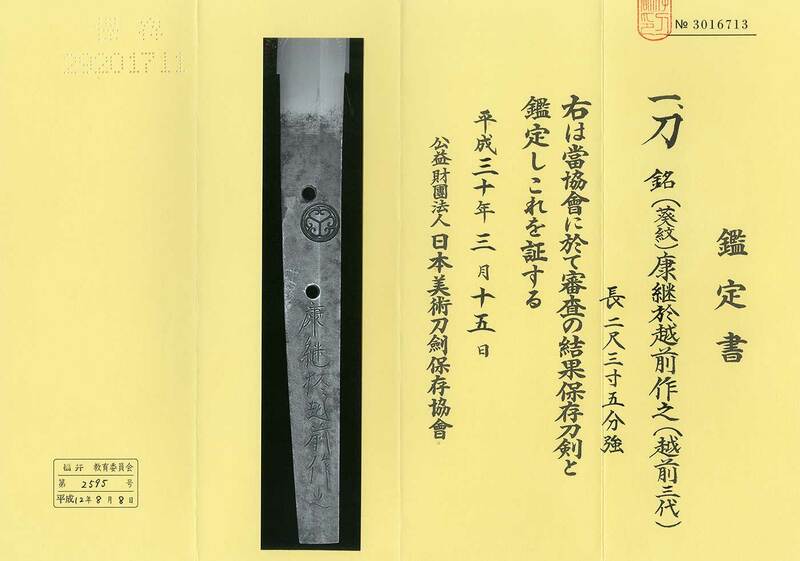 This blade was used Nanban Testu(imported iron). At a glance, the blade looks like Echizen Rai.